YoYoFactory - Get Ready to Take FLIGHT! We couldn't agree more and couldn't be happier YoYoFactory decided to take the chance and enter the Offstring scene with an amazing new yo-yo! The Flight is ready for takeoff! 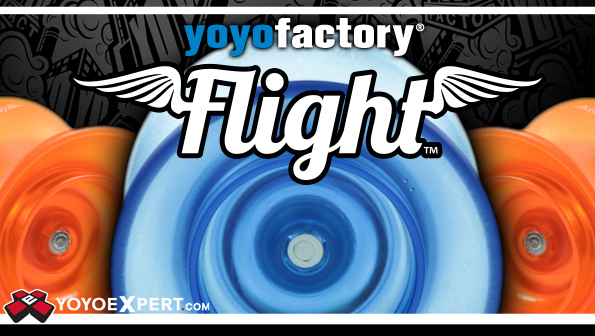 The Flight is the first YoYoFactory yo-yo designed for competitive 4A freestyle play and they nailed it! This is one of the best offstring yo-yos we have thrown in a while. Floaty, fast, maneuverable, and really fun to play! And just take a look at that price tag - You'll be hard pressed to find an offstring yo-yo that performs at this level for that price! The Flight has a nice simple design that gives you unbelievable performance. Nothing crazy or super radical, YoYoFactory designed a smooth stepped profile with an inner ring to improve weight distribution and help with grinding tricks. Made of a very durable plastic, fitted with a thicker axle and easily removable spacers, the Flight is built to last and perform at it's best wherever you take it! The Flight may be YoYoFactory's first attempt at a competition 4A design, but just give it a few throws and the Flight will be soon become the first 4A yo-yo you reach for!